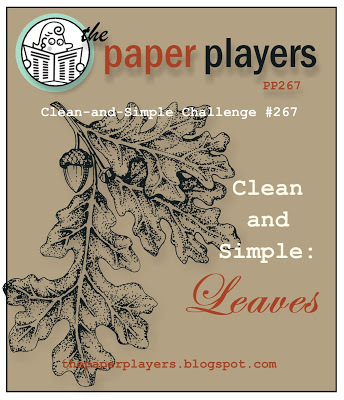 And the challenge photo definitely has a neutral palette as well,so I set to work! 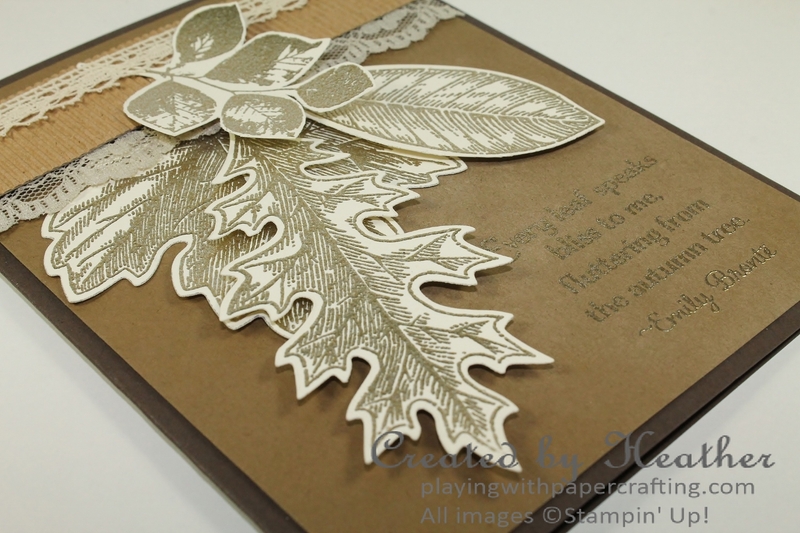 One of the changes that Stampin' Up! made that I had a hard time with was when they discontinued the Pewter Stampin' Emboss Powder. I liked its neutral quality - not as warm as gold, and not as cool as silver, just somewhere in between. That's why I was so excited a while ago, when I discovered I could make a roughly 1:1 mixture of Gold and Silver Stampin' Emboss Powder and it would give me a similar effect. That's what you're seeing here for the leaves and the sentiment. 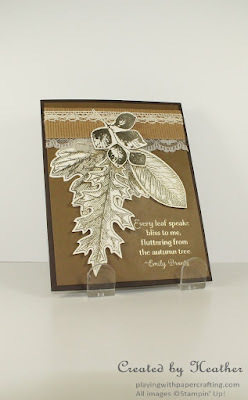 Three stamp sets are used for this card: Vintage Leaves, Lighthearted Leaves for the sentiment and Kinda Eclectic for the small spray of leaves used at the top. Sahara Sand Lace and corrugated kraft-coloured paper topped with some Venetian Crochet Trim give an eclectic, but still neutral embellishment at the top of the page. I really like the way this turned out. 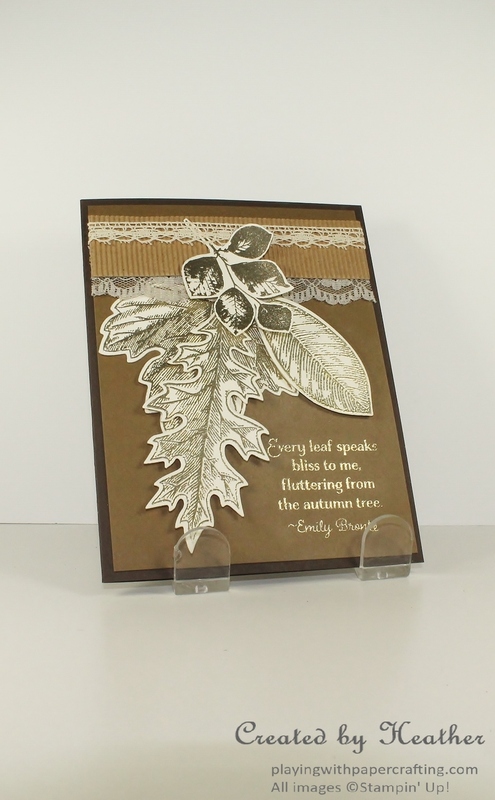 Try a mixture of the gold and silver embossing powder for yourself and see how it turns out for you. Don't forget that this sale is only on until Friday! 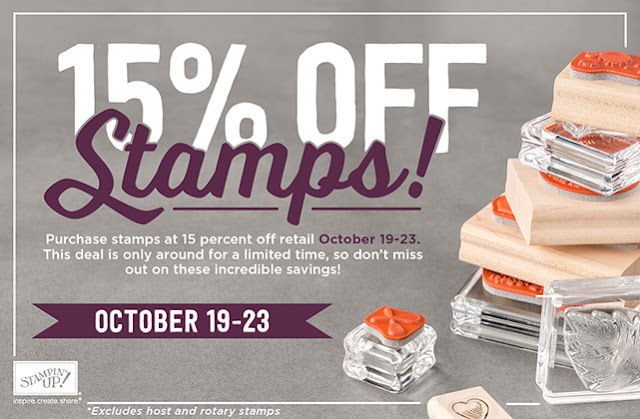 Stamp sets rarely go on sale, so you definitely don't want to miss out on this one. Shop at my On-Line Store or email me with your order. So easy!